The Agence Nationale des Parcs Nationaux are working towards building national pride around a remarkable forest landscape and to this end, have approached consortiums to submit proposals for a forest canopy walkway. On the outskirts of Libreville, lies the forest Arboretum Raponda Walker, home to a large forest reserve with many large and some massive trees. There are two aspects being developed on the site, the one is a path of discovery in the forest and the other is a canopy walkway around three major trees, Mohamed VI, the Ambassador and the Brothers. 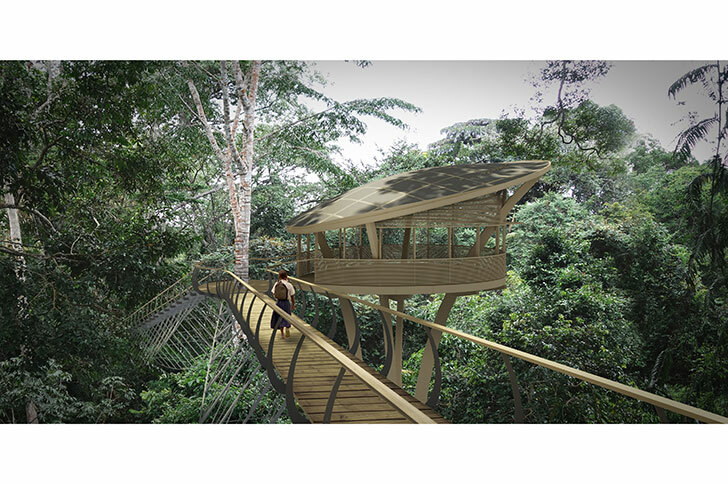 It is intended that this team, doing the Canopy walk, will collaborate with the other team doing the path of discovery, so that there are contiguous elements and experiences for the visitors to this magical place. The area of the Canopy walkway varies in level quite dramatically, with a top land height of about 30m above sea level and a bottom of river bed height of about 14 metres. The forest is dramatic and densely populated and full of bees, insects, snakes, birds and the remarkable sound of ancient trees rubbing against each other. In order to fully explore the visitors experience of the forest, there are two structural systems proposed. The first is a supported walkway, which starts on the ground and uses the natural fall of the land to gain elevation until it is about 15 metres off the ground. The supported walkway snakes around the trees and gets wider at key view points, especially in the area of Mohamed VI. The overall length of the walk is 150 metres. It connects (at the Brothers) with the suspended walkway at a height of about 20 metres off the ground. From here, the suspended walkway continues, narrower and linked between trees, taking visitors on a magical route discovered long ago by Mike Fay and Andrew Coates. In general the spans between trees is limited to about 30 metres, and the elevation of the walk will be informed by the site. The maximum height visitors will get is about 30m above the ground, from where the views will be spectacular. The suspended walk runs for approximately 300m gently lowering the visitors down to the ground again near the Ambassador. The concept is of an elevated circular walk through the forest on a natural slatted timber deck with safe handrails and a full range of views and experiences in this epic forest. The design team met up in Gabon in early September and fully investigated building the entire structure out of local timber (there was time, cost and risk limitation here) this option was excluded. We then developed a sub-structure for a supported canopy walk in galvanized steel (pre-fabricated in South Africa) and assembled in Gabon, with a timber superstructure and decking made in Gabon. Following a route mapped out by 3idGabon we developed a simple, narrow, cable suspended bridge structure also made from galvanized steel with ribs, decking and mesh, the same as the supported walkway, designed to span 30 metres between trees, using the trees as support in a non-invasive way. Working with steel as the most cost effective and low maintenance solution, we are planning a pre-fabrication by laser and bending in Cape Town South Africa, of all the structural components of the bridges. These will be pre-assembled by a known and reputable supplier in factory conditions, then disassembled, galvanized and packed into containers for shipping direct from Cape Town harbour to Libreville Gabon. All the timber components, (laminated hardwood rails) and shaped decking slats, will be pre-made from locally sourced timber in Gabon, for assembly on site. All the galvanized steel is to be etched, primed and painted with 3 coats of high quality paint to later specification, this to limit future maintenance requirements. The columns of the supported structure will be stayed in position by cables linked to ground anchors and supported on pre-cast concrete footings. The suspended walkways will be carefully fitted to existing trees, via pre-made circular tree rings that are mounted off the layers of the bark, to allow for future expansion and to prevent any blockage in terms of nutrients to the canopy. A simple circular platform around each tree will allow visitors to pause and gaze at the forest, and to be part of the canopy. By using the same stanchion shapes in steel, the suspended bridge will tie up nicely with the supported bridge. We will establish the safest way to structurally connect the suspended walk to the trees without causing damage. The maximum gradient at bridge ends near tree will be 25%, ie 1:4 this to prevent slipping. The supported walkway rises at a gradient of 1:12, supported on steel columns at 15 metre centres. Generally the lean rail height will be 1080 to the centre of the rail, with heavy duty (replaceable) nylon mesh is envisaged for fall protection under the rails and on the ribs. Generally steel is ex 6, 8 or 10mm plate, laser cut and pre-assembled with bolted connections to limit on-site welding. The supported walkway is envisaged as 150 m long and the suspended walk 300 m long, the site and the budget may well reduce these distances. Suspended walkway width 600mm, supported walkway ranges from 1200 to 2400mm wide with integral benches and signage. Cables assumed to be double 25mm thick steel cable. No trees to be cut or damaged in the process, and all components limited to a maximum length of 12 metres.